Sulyman is angry. Angry with himself, because he cannot do anything but “sleep, eat, drink” – in a house with 40 other worrisome men. And he is angry with the authorities. Six months have passed since his application for asylum; six months, in which his wife and small children have persevered between the front lines waiting for a family reunification visa. What, if the Syrian war is faster than the German authorities? 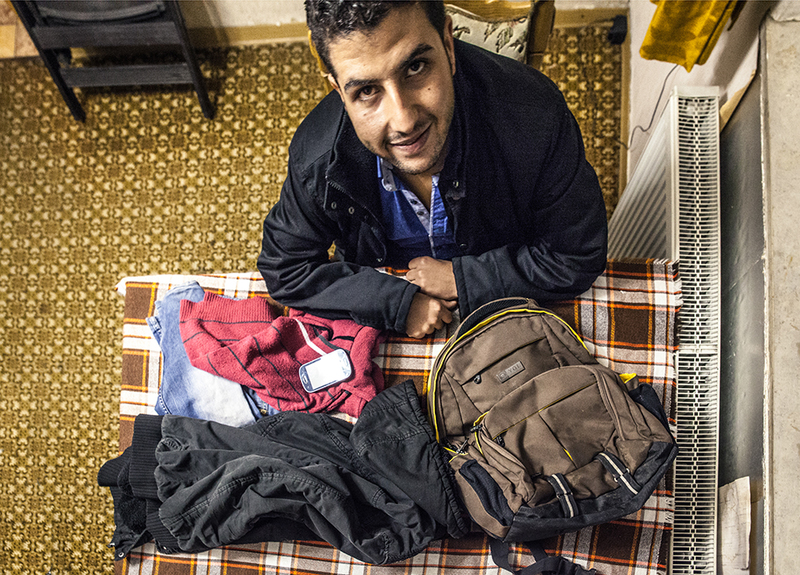 Ten days have passed since Sulyman, 35, has heard from his wife and children. Apparently the power was cut off again in northern Syria, where his family lives. The last news were alarming: Four grenades had hit in a week, the residents were trapped in their houses – everyone could become a target. Water and food was running out, his wife had told him, and the Daesh (ISIS) militia was gathering in front of their city. 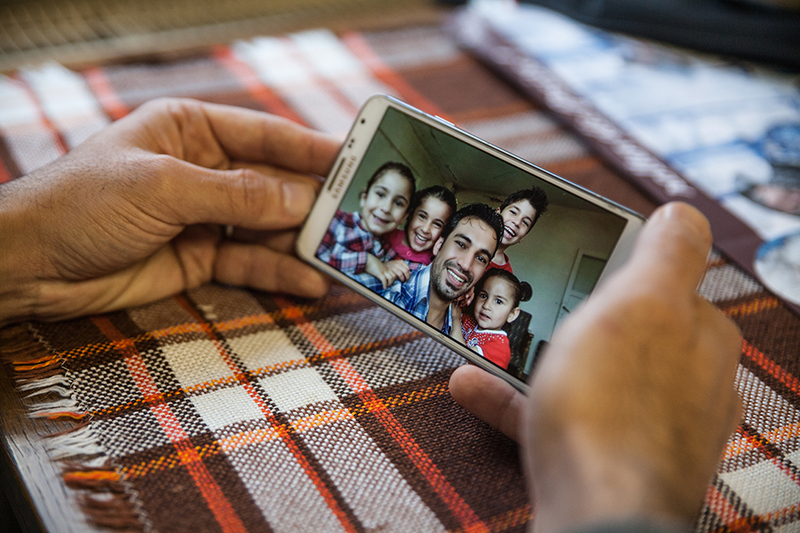 He shows us a photo on his phone: a handsome young man surrounded by four beaming children. The same Sulyman in another life. How dearly he wanted to take them along with him! They tried twice. And twice the Hungarian police sent them back shortly before their final destination. “We ran four hours without ceasing, over hill and dale,” Sulyman recalls. His youngest daughters were only three and four years old at that time. “Once the policemen sicced their dogs on us until they tracked us in our hiding places.” The last time the police even beat them up. Sulyman’s children don’t remember peace, all they have known is a time of war. His eldest son and daughter would attend 2nd and 3rd grade now, but they could not even start school yet; there just is no school. The family’s home was destroyed three years ago; since then they share a tiny rented flat with his parents. Around his tailor shop battles were raging until Sulyman had to give up his business. While the family no longer had an income, food prices multiplied. Finally Sulyman leaves on his own. His escape will cost 3,500 euros; to pay for it, he sells his last possession, the car. Once he arrives in Germany, he will send money and let the family follow him on a safer journey. With a visa and an air ticket. That was the plan. Reality turned out totally different. It first led him across the Aegean Sea between Turkey and Greece. A cell phone photo shows Sulyman sitting on a nearly invisible boat of which every square centimeter is occupied by refugees. He counted 47 of them, including many children. Many refugee stories end here. They will never be known. Only those that continue with a saving phrase can be told: It all went well. For Sulyman it went well, somehow. He lived to tell his story. From Greece, he made it to Austria on foor within a month. When his feet were too swollen to continue in Serbia, the Red Cross treated him. 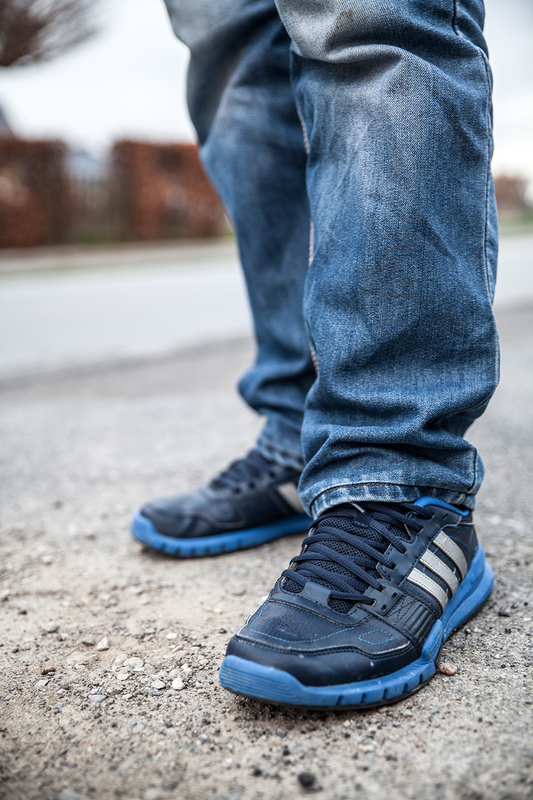 He swapped his worn-out sneakers with new ones, and walked on. Alone, he finally managed to escape from the Hungarian police. 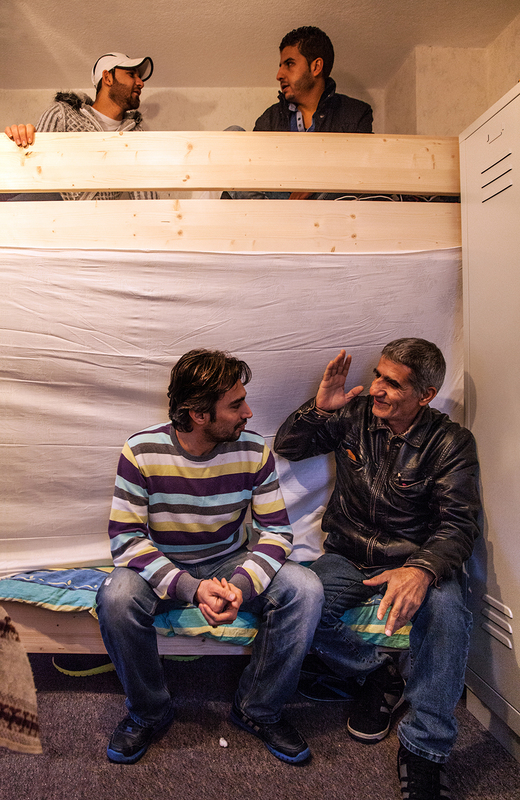 “My daughters always beg me on the phone, when I will finally come back,” Sulyman says quietly. His eldest son no longer asks. He understood that Germany is not around the corner. But Sulyman knows how to dream. He can still imagine a future in Germany for his whole family, even in very concrete terms. He would take up work as a tailor and send his children to school. Once the war is over, his children will decide whether to stay or to return. “They will”, says Sulyman. Not “would”. A jacket, a pair of jeans, an old cell phone, university certificates and a backpack. This is all Osama took with him from his old life. This and his nightmares. His thoughts circle around that one day in 2013 at the University of D.*. Osama and his fellow students were about to begin a demonstration for freedom, as the military drove up. The 22-year-old remembers shots into the air, soldiers beating demonstrators with rifle butts and his own hasty escape. They did not find him, but they arrested many of his fellow students, including his best friend. Months later his friends was released from prison – only to die immediately afterwards from his torture-inflicted injuries. The Syrian regime perceives the city of D. as a thorn in its side, because this is where the revolution leading to the Civil War started in 2011. Osama was expelled from the university – according to him, because he volunteered for a UN organization, teaching children in Syrian villages without schools how to read. The NGO was perceived as foreign influence, says Osama. According to him the university’s administration found that totally suspicious; when he tried to complain, they took his money and mobile phone. He borrowed 2,800 euro for his escape, which led him in trucks through Turkey, across the Aegean Sea on a brand-new (and never tested) rubber dinghy and a clueless “captain”. He crossed Greece in an animal transporter and continued from camp to camp through the Balkans. His girlfriend could not muster that money and stayed behind. The men’s voices echo off the barren kitchen walls. This makes their excitement sound even more excited and their reproaches even more reproachful. “Khamsa”, I understand and “seta”: “five” and “six”. More and more men come into the kitchen and tell us how many months they have been waiting for nothing but the next step in the asylum procedure. Sulyman is quite a fan of Germany. Four of his uncles have been living here for decades and he has been reading about the country for many years – not knowing how much he would one day need that knowledge. But now even he is desperate and a little angry. Angry with himself, because he can do nothing but “sleep, eat, drink” in a house with 40 other worrisome men. And angry with the authorities. Six months have passed since his application for asylum – six months in which his family has persevered between the front lines waiting for a family reunification visa. Which will only be issued once the application for asylum has been approved. “The authorities already work at full throttle” the volunteers say, trying to appease the angry men. Sulyman nods, but his face shows what he is really thinking: What if the war is faster than your authorities? For days the Syrian telephone network and internet have been interrupted – and thus also the contact with their families. The first men regret their decision to have ever escaped. 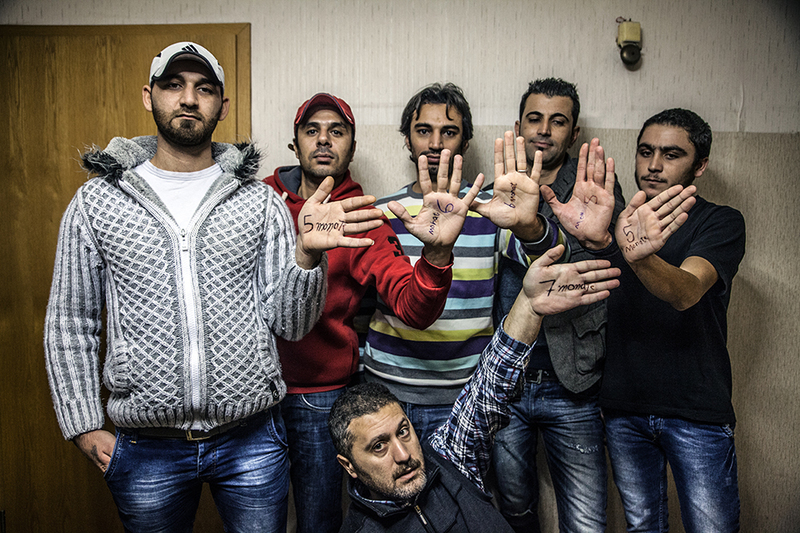 Without them, their families in Syria are even worse off. Their plan to let them follow by visa immediately has totally failed. Would you like to read more? Welcome to subscribe to my occasional newsletter where I share current features, photo essays, portraits and interviews. If you are no longer interested, you can easily unsubscribe with one click. Or just follow me on Twitter or Facebook.